To the attention of startups! You have a unique opportunity to join the Skydeck Berkeley acceleration program! So, hurry up! 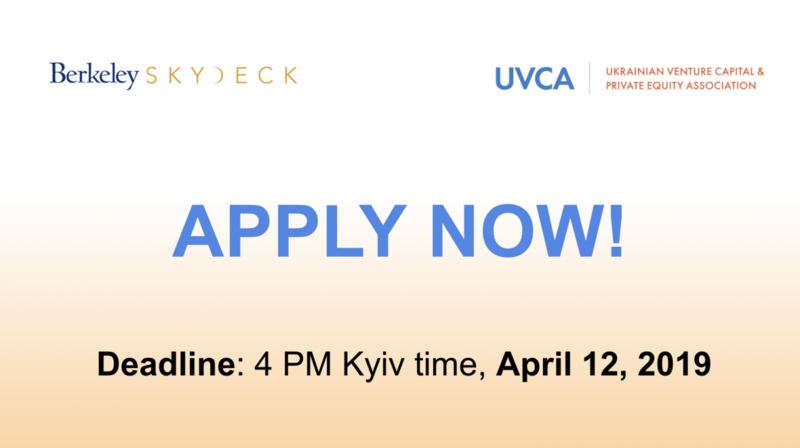 As a Global Strategic Partner of SkyDeck Berkeley UVCA has the privilege of recommending up to 2 startups, who will be guaranteed a first-round interview into Berkeley SkyDeck acceleration program (only 15-20% of startups get a first-round interview!). DEADLINE for filling out the form: 4 PM Kyiv time, April 12, 2019. REQUIREMENTS: Evidence of business potential (revenue, users, customer interviews, a demo, a prototype, or a patent or significant scientific/technical breakthrough), team must be for-profit and ready to begin interacting with mentors and potential investors. - to prepare founders to pitch on Demo Day to 600+ investors.